Jane Watson is an Australian novelist and short story writer. Her debut novel, Hindustan Contessa, is published by Picador. 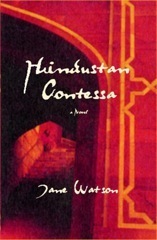 Hindustan Contessa was bought by Pan Macmillan Australia after the first 100 pages were read by their editor at the Tye Novel Writing Conference run by John Marsden. Her short stories have won the My Brother Jack Short Story Award, The Alan Marshall Short Story Award and been a prizewinner in The Age Short Story Award. She has been widely published in literary magazines. The film Ibrahim based on one of her popular articles in The Age won an A.T.O.M award. Jane lives in Melbourne, Australia. She can be found in Second Life at her office, The Writer’s Studio, run by her avatar, Arton Tripsa.